Home | Serigraphs and Giclee Fine Art | Liudmila Kondakova Parisian Art | Liudmila Kondakova Signed And Numbered Limited Edition Serigraph:"Rive Gauche "
Liudmila Kondakova Signed And Numbered Limited Edition Serigraph:"Rive Gauche "
Image size: 24 " x 36 "
About the Print: "In my art, the essence of beauty has always rested in the details". - Liudmila Kondakova From her early days at an icon-painting workshop in Moscow, Liudmila Kondakova was taught to believe that beauty lies in the smallest detail and that detail's almighty. In Rive Gauche it is evident that the artist is completely enamored with the aura of Paris and that she wishes to convey this to viewers of her work through meticulous attention to each characteristic that makes up the city. 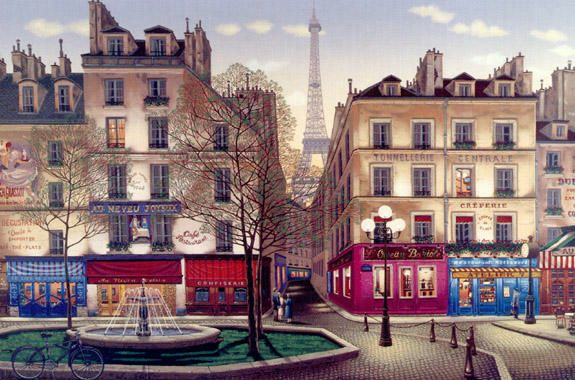 Whether it is in a quaint cafe, a cobble-stoned boulevard or the mighty Eiffel Tower, Kondakova's imagery evokes the ambience of the city as it is today as well as the charm of yesteryear Rive Gauche (translated Left Bank) is located in the southern section of Paris. It is a name used interchangeable with the 6th Arrondissment (district). Consisting of two very different areas, the cozy Latin Quarter and the stately 7th Arrondissment, many who visit the area are taken by it's powerful images. Populated today by students and academics from the Sorbonne, it was also home to former President Mitterand. Home | Fine Art Prints & Limited Editions | Gallery Direct Art is your Authorized Chalk & Vermilion Dealer | Liudmila Kondakova Parisian Art | Liudmila Kondakova Signed And Numbered Limited Edition Serigraph:"Rive Gauche "